Start reading When: The Scientific Secrets of Perfect Timing on your Kindle in under a minute. This book didn't grab me as quite as much as the the author's previous works hence 4 rather than 5 rating.This is more about me that the author. I've been working on timing for a very long time! 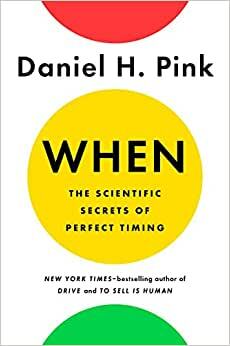 I agree with the author's assertion that timing isn't everything rather everything is timing. I particularly valued the work in the early part of the book about the process of "peak-trough-rebound". No doubt that I will be valuing my breaks, naps and long walks even more than I already do. I also highly valued the bits about endings and that the best endings are not necessarily happy rather poignant and meaningful. Another outstanding book by Dan Pink. Beautifully written and easy to read, the book has fascinating stories each demonstrating a number of points. The research is interesting and valid. While I knew about some of the research, and intuitively other parts of it made sense, much of it was fresh. At the end of each section were useful tips, laid out in an easy to use fashion. Like the other down under colleague that wrote a review, I also like the fact that even where the research pointed out challenges, so even when timing is bad, there are ways to get a better outcome. Great closing sentence. It’s clear that timing is important, but this book illustrates just how much it affects everything we do. I liked the examples given and have a new appreciation for how I should approach some of the tasks in my day. Definitely worth the read. 5.0 out of 5 starsExcellent well researched book. I thoroughly recommend it.I have read most of Dan’s books and this is up with the best - a whole new mind and Drive being the others. Love the fact that what he has written is backed up with good research. This book effortlessly combines scientific research and with engaging stories that impact every part of our day (and lives). In a world look for an edge, when may have more impact then why. I got a lot out of this book - it has helped me plan my day better to maximise productivity plus I will never book surgery for the afternoon - ever!